Josh van der Flier (left) and Adam Byrne (right) visited Greystones rugby club to meet the stars of the future. 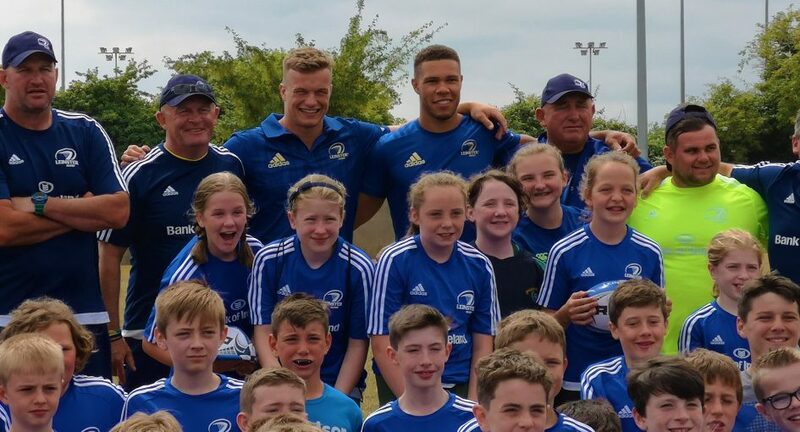 Irish rugby stars Josh van der Flier and Adam Byrne paid a visit to the Leinster Rugby summer camp in Greystones today to meet some of the future stars of the sport. Van der Flier (25), and Byrne (24) went along to Dr. Hickey Park to sign autographs and take pictures with the young boys and girls who were taking part in the summer camp. Wicklow-native Van der Flier is currently recuperating from a serious knee ligament injury which he sustained playing for Ireland against France in the Six Nations earlier this year. However, the injury didn’t stop the Leinster flanker from taking part in drills and exercises with the kids as he and his Leinster teammate Byrne were put through their paces by the future stars of Irish rugby.